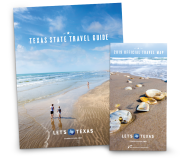 Texas is known for major urban centers, rugged ranchlands, and charming Hill Country towns dotted with springtime wildflowers, but scattered among them are some of the country&apos;s best swimming holes. Several are famous. Others are well-kept secrets. But they all beckon on sunny summer days. I&apos;m floating on my back in the emerald waters of Hamilton Pool, watching droplets cascade from the cliff overhang above. Around me, families splash in shallow waters. College students gather atop massive rocks inside the interior walls of the cave-like structure. But I keep floating. I&apos;ve heard about this place for years, but today marks my first trip to the natural pool that lies just 30 minutes west of Austin. During peak times, visitors wait for up to two hours to enter this pristine place, which is part of a federal preserve and thus is regulated to ensure balance between our enjoyment of it and the health of the plants and wildlife. A bit of idling (plus a $15 vehicle admission fee) seems a fair price to pay for play in Hamilton Pool&apos;s ethereal waters, which are well worth the wait. There are mossy stones, plants growing upside down from the domed roof, and trails to explore—both from the parking lot to Hamilton Pool and along its interior rim. And it&apos;s not the Hill Country&apos;s only gem. Farther north is Krause Springs. This 115-acre property is listed on the National Register of Historic Places and has been privately owned by the Krause family for more than 50 years. The generous family pioneered improvements—a lovely man-made pool overlooking the springs, stone picnic tables and gazebos, and a butterfly garden—building many structures by hand. Below these resting points sits the main attraction: two conjoined swimming holes. With massive cypress trees, waterfalls tumbling over fern-covered granite, and a rope swing, Krause Springs is an awesome spot for river-lovers. Those wanting an overnight stay can pitch a tent in the campground or hook up an RV in designated spaces. Day-trippers can end their journey with BBQ in Spicewood, where Opie&apos;s and It&apos;s All Good are two of the favorite establishments. To the south of Austin, you&apos;ll find Wimberley, a quaint Hill Country town known for its community of artists and—you guessed it—its swimming holes! The first, Jacob&apos;s Well, measures 12 feet in diameter, but the relatively small opening doesn&apos;t dissuade swimmers from cliff jumping. Lighter colors surrounding the hole morph into dark hues that correspond to depth: Jacob&apos;s Well descends 30-ish feet. I visited on a fall day after the end of swimming season, so I checked out the well visually, then hiked the trails surrounding its northern edge. Because Jacob&apos;s Well is the smallest of the swimming holes mentioned here, I&apos;d recommend arriving early at this spot before venturing to Blue Hole later in the day. The ten-minute drive takes you through downtown Wimberley, so if you&apos;re hungry, stop at the sophisticated Leaning Pear (one of the owners graduated from the Culinary Institute of America) or pause for a burger at the historic Cypress Creek Café. The 1937-built structure includes a patio suitable for post-swimming attire. Blue Hole Regional Park is stunning: There isn&apos;t a literal swimming hole, but rather a winding river like what you see at Krause Springs. The water is a lovely shade, thanks to Jacob&apos;s Well (Cypress Creek&apos;s main water source) and the limestone bluffs above Blue Hole (rainwater filters through the rock&apos;s holes, causing lightening of color). In addition to swimming, Blue Hole offers a modern pavilion, a sprawling lawn, and amenities that include picnic tables (some with fire pits), basketball and volleyball courts, and 3.5 miles of trails. When I&apos;m in the mood for exploring Austin’s city limits, I hit up Barton Springs or Deep Eddy Pool, two natural swimming spots near downtown. Barton Springs is as Austin as it gets. 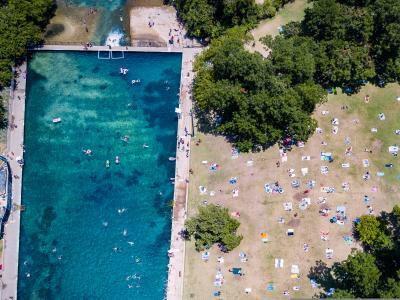 The popular destination is located in Zilker Park (home to the city&apos;s annual ACL Music Festival) and is known for its year-round temperature of 68 to 70 degrees, courtesy of spring-fed water coursing through the Edwards Aquifer. Grassy knolls slope down to the waterway, where adults and kids splash, float, and swim the occasional lap. When I&apos;m feeling brave, I plunge from the diving board located in the center of the three-acre pool. When exercise calls, I head to Deep Eddy Pool, another spring-fed sensation in Central Austin (and the state&apos;s oldest swimming pool), this one boasting around six lap lanes. Originally a swimming spot along the Colorado River, Deep Eddy retained its spring waters when a local built a concrete pool over the site. For decades, it was the focal point of the Deep Eddy Bathing Beach, a resort-like destination that included cabins and a giant diving platform from which horses and riders leapt as part of Lorena&apos;s Diving Horse. The city later purchased Deep Eddy, and today its attractions are a family-friendly wading area and lap lanes for the athletically inclined. Unsurprisingly, summer days can be busy at the pools, so take advantage of fewer crowds on weekdays and off times when possible. Also note that each swimming hole has different rules of entry (and different prices), so check individual websites before embarking on your aquatic adventure. While visiting family in Texas, a young Robert Redford learned to swim in the cool waters of Barton Springs. Decades later, he produced and appeared in The Unforeseen, an award-winning documentary regarding real estate development near the springs. 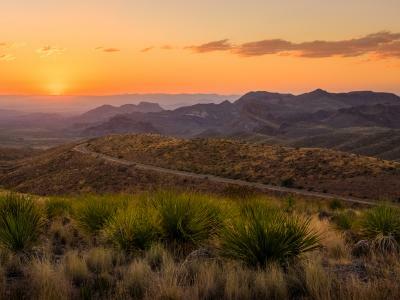 An attorney-turned-journalist, Millie Kerr has traveled the globe chasing her love of adventure, but she'll always consider San Antonio home. Although Millie primarily writes about travel and wildlife, she's a generalist eager to tackle new terrain.